A great 'moment in time' captured live that features classic Apple songs, extended improvisational jams, a few cover songs, and a very warm, enthusiastic audience! The 3rd installment of the "Official Bootleg" series features the full 5-piece live band during the River To The Sea era. 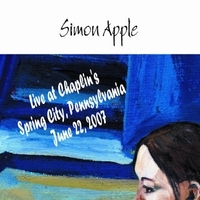 This is one of Simon Apple's best shows that was recorded during this time. Chaplin's is a favorite venue of the band... a really nice, intimate setting. The audience is particularly warm & responsive this night, and truly becomes part of the 'charm' on this recording. The show features 8 songs from the River To The Sea album, one song from the Apples To Apples Archives album (The Paper Said), and 4 'fun' cover songs: Pretzel Logic (Steely Dan), Scenes From An Italian Restaurant (Billy Joel), How Sweet It Is (Motown classic), and a very brief impromptu version of Low Rider (War)! This show documents the band's extended improvisational jams (including an excellent 15 minute version of "A Way Inside"), as well as their light-hearted sense of humour. "Simon Apple brings together a rare mix of influences with great writing and classy musicianship. Running from sophisticated "progressive" rock, to appealing pop, to articulate singer-songwriter material, they are likely to surprise you with the ease in which they move seamlessly between them. While many groups may have some difficulty translating such music from the studio into live performance, Simon Apple brings all the sheen of their CDs to the stage, while also launching into great jams!” - George Graham (WVIA-FM radio host; Wilkes-Barre/Scranton).